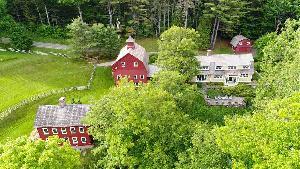 Scroll down to discover current homes with barns for sale in the Upper Valley of Vermont and New Hampshire. Look through hundreds of listings to find your new home. Contact us if you are interested in touring one of the currently listed Barnard Vermont homes below or any other property.
" Flag Farm": a completely renovated antique colonial farmhouse with historic barns is ready for a new owner to move right in. From the gorgeous cherry eat-in kitchen with vaulted ceiling to the classic, square living and dining rooms, this home is a beauty. One of the barns is painted outside with a huge American flag, which has been recently refreshed. 5 bedrooms, 3 baths, office spaces and adorable in-law apartment. Beautiful wood floors. Great storage. On a quiet country road with little traffic, yet close to everything. Superb! This 1800 Farmhouse has kept much of its original characteristic, wide pine floors, VT castings wood burning stove, exposed beams. Great eat in kitchen with wood burning stove and formal dinning room. Then 4 bedrooms on second floor and large communal living room. Convenient location to Hartland Elementary, DHMC and Upper Valley. 3 bedroom, 2 bath home on a quarter acre lot which has frontage on the Connecticut River. Nice eat in kitchen, living room, family room and bathroom on first floor. Three bedrooms and another bathroom upstairs. Walking distance to West Lebanon shopping, and on a bus route! A great investment property.